Our 2017 Soap Box Derby! Okay, so there are no engines or gasoline. And we’re in North Texas, not Florida. And the food vendors sell gourmet grilled cheese and sliders. But nevertheless, the excitement of the crowd is still the same! 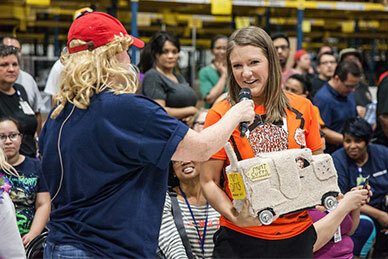 Last week, our Distribution Center hosted our 11th Annual Soap Box Derby, and 36 cars from both the Distribution Center and Home Office competed for the coveted cup. 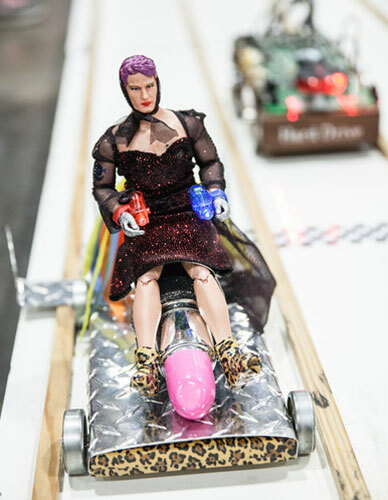 This year’s race brought an impressive range of designs, including cars modeled after famous people (Tony Romo , Piet Mondrian), ‘90s comedies (Dumb and Dumber, To Wong Foo…), The Container Store products such as AMAC boxes and elfa, and many others. Team "Mutt Cutts" with a Dumb and Dumber theme: straight outta Aspen, California. The day’s festivities began with guest food trucks providing tasty meals from all the major food groups: cheese (Ruthie’s Rolling Café), meat (Easy Slider), and ice cream (Gypsy Scoops). With our bellies full and our pulses pounding, we headed into the DC to watch the races. There were close calls, crashes, upsets, and photo-finishes, but for the second year in a row, the “Nasty Waters” team from Distribution Center Replenishment and Put Away emerged victorious! Behold the fearsome horsepower of "Nasty Waters." 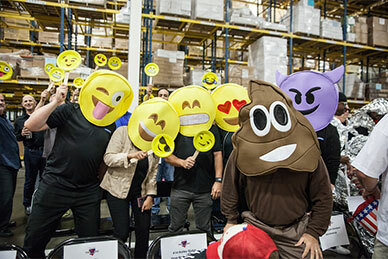 In other award categories, our Customer Solutions Department’s “To Wong Foo…” car took home the coveted “People’s Choice” prize based on employee votes, and the Information Systems team’s “EmotiCar” won Best Team from our judging panel for their excellent costumes, team spirit and raucous cheering at the event. "To Wong Foo": quite possibly the best soapbox car to ever feature Patrick Swayze in a dress. When the smoke and scent of burning rubber had dissipated (from our imaginations), we all headed back to work, the winners celebrating their victories and the rest already preparing for next year. 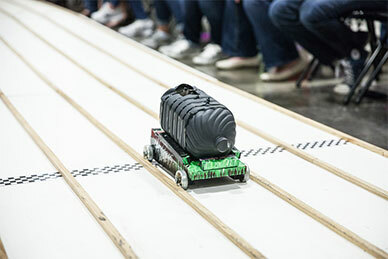 In the fast-paced soap box derby world, there’s no rest; there’s only the next race to think about!